See the top 50 keywords and the 25 least popular keywords ("bring a friend back from the dead" is very specific) used for Canadian poetry books. 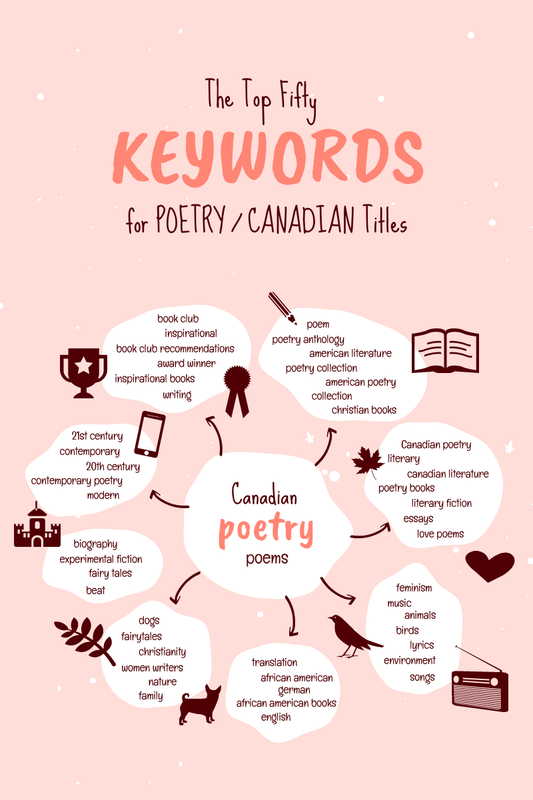 April is National Poetry Month, so in our continuing efforts to celebrate the fact that more Canadians than ever before have been buying books by Canadian poets, we decided to take a look at how keywords are being used in the metadata for poetry books. Of the 26,675 titles with Non-Fiction / Poetry BISAC codes, only 4,136 of them use any keywords at all, and of those, only 420 are Canadian-authored. Using our BiblioShare database, we pulled together a list of the top 50 keywords used for Canadian poetry books in an attempt to illustrate what all the fuss is about. Despite best practice recommendations (more on that below), unsurprisingly "poetry" is the top keyword, followed by "Canadian" and "poems." There are many keywords in this list that restate data that's discoverable by other fields (e.g., "poetry," "Canadian"), which goes against the guidelines proposed by BISG's Best Practices for Keywords in Metadata. There are also several keywords that seem to contradict the BISAC code and/or the Canadian contributor marker assigned, such as "american poetry" and "literary fiction." Despite that, we can gather from this list that the typical Canadian poetry book is written by a contemporary African American woman (or women), and that it's about feminism, nature, music, love, birds, family, fairy tales, Christianity, and dogs. It's inspirational, award-winning, and recommended by book clubs. And it's fictional, yet slightly biographical. It has also been translated from German. Jokes aside, it's clear from the list that Canadian poetry is wide-ranging and reflective of our diverse Canadian identity. cats (POETRY / Canadian) - Interestingly, Canadian poetry books about dogs are much more common. female sleuth... (POETRY / General) - The ellipsis is probably for suspense. Want to see what keywords are being used on other books? Our handy Biblio-o-matic Chrome extension detects ISBNs while you're browsing the internet and pulls data from BiblioShare on things like pub date, keywords, cover images, list price, and more. See how it works or try it out. It can be tricky choosing which keywords will be the most helpful in constructing the best metadata, and so BISG's Best Practices for Keywords in Metadata often takes a backseat. However, if everyone followed the rules, reading a list of keywords wouldn't be quite as fun.